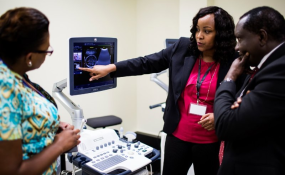 GE Healthcare partnered with the Nigerian government and USAID to train 1,300 midwives on portable ultrasound equipment – impacting two million expectant mothers and helping drive down maternal-infant mortality rates in the coming years. As the healthcare segment of a digital industrial company, GE Healthcare is expected to do what any business must do: drive growth and a strong balance sheet. Even as we continue to meet those expectations, we know that healthcare is not just any industry. A business like GE Healthcare wouldn't survive if we weren't working for a greater purpose. The business of healthcare is inextricably linked with the humanity of healthcare. Take perhaps one of the starker healthcare challenges across the globe: of the 5.8 billion people with limited access to healthcare, women and their children are disproportionately impacted. Two and a half times as many adolescent girls in sub-Saharan Africa are infected with HIV versus boys of the same age. In low- and middle-income countries, women experience a higher proportion of cardiovascular deaths than men. Approximately 830 women in mostly developing nations die from preventable causes during pregnancy or childbirth every day. Flip the coin to look at the business of healthcare and we see more disproportionate trend lines in their own right: Only 38% of the top global health jobs are held by woman. While women contribute $3 trillion to the global healthcare industry, nearly half of their work is unpaid. How can we expect to address the challenges that one of the world's most vulnerable populations faces when that population itself is not equally represented within the decision-making sphere? In our business – when healthcare is so personal – we can't. There are already efforts in process to chip away at these challenges. Organizations like UN Women and Women in Global Health are leading efforts to support more inclusive healthcare leadership participation and policy development. Another effort was announced recently in India, when Tata Trusts and GE Healthcare committed to training 10,000 young people in various technical areas of healthcare to bridge the skills gap. Our aim is for at least 50% of these trainees to be women. These newly skilled women will not only help India tackle one of its biggest impediments to quality healthcare, the need for an estimated 6.5 million new health professionals, but will gain a life-long profession. This effort is one piece of a $1 billion commitment we made to train more than 2 million healthcare technology professionals. In India alone, more than 5,500 people have been trained already. One of them is Nisha (in the picture above), a young woman who had never used a computer or left her village until being accepted into the training program. Today, she is an x-ray technologist at one of the largest hospitals in Mumbai and paying for her younger sisters' schooling. When I was in India preparing for the Tata Trusts partnership, three other trainees who were early enrollees in these programs came to speak to us. They stood in front of a room full of business "suits" and their sarpanches (village leaders), the intersection of both ends of the healthcare coin, to discuss the skills they had gained in training and how they would be putting them to use in their new jobs. They were proud and ready to change the world. As more trainees follow, how many of their families and neighbors will benefit from this knowledge? How many patients will receive care from them? How will the percentage of women in top global health jobs increase and, as a result, the number of women without access to healthcare decrease? We are not after perfection, we are after progress. Imagine the change we could affect if every organization took an intentional step forward in their advancement of women. To advance gender equality in global health, we are calling on global organizations to make a commitment before the next World Health Assembly in 2017. No matter where any of us fall in our role within healthcare, let's ensure we have an equal representation of women in the jobs that have the ability to impact the world. Many industries struggle with this challenge. In the business of healthcare, we have a unique ability and reason to solve it. Doing so can in turn tackle the pressing challenges threatening access to healthcare across the world. It's good for business. It's good for humanity. That it's increasingly possible – no, necessary – to do well while doing good is what makes healthcare so special. That it's already happening is reason 5. This article first appeared on LinkedIn and on GE Healthcare's Pulse. Copyright © 2016 GE Africa. All rights reserved. Distributed by AllAfrica Global Media (allAfrica.com). To contact the copyright holder directly for corrections — or for permission to republish or make other authorized use of this material, click here. Nigeria: "When You Train a Woman, You Train a Generation"
Mozambique: "My Father Told Me that this was not a Field for Women"
"When You Train a Woman, You Train a Generation"